Talking about Supercar-powerful wagons, you can literally count the name on fingers. Cadillac CTS-V Wagon, Audi RS6 and the Mercedes E63 AMG is all knocking doors, out of numerous present. Well here is an addition. 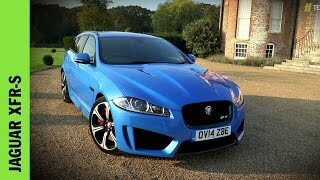 The Jaguar comes with its new model, XFR-S Sportbrake 2015 at the 2014 Geneva Motor Show.This wagon though won’t be for the U.S buyers but still Jaguar has taken this great step for there other showrooms by putting their biggest engine in this model. 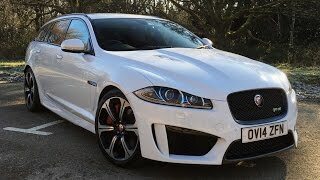 Let us see the specifications of Jaguar XFR S Sportbrake 2015 little closely. The specs above definitely claim the Jaguar XFR S Sportbrake as a highly powerful beast for road but this is not all to convince a buyer. To get convinced with performance what matters in the Interior and Exterior of Sportbrake 2015. Let us take a sneak. For Interior of XFR S Sportbrake 2015 in one line we can say, ‘traditional jaguar with blend of sports car’. The cabin inside holds warm charcoal colored leather but you can also notice carbon fiber patterned leather on the bolsters and door trim. Unique dark aluminum trim is very well covering the dashboard. For rest you can say, ‘Its Jag’. 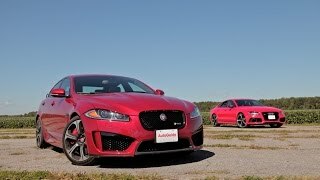 The aggressive nose with the massive intakes is what you’ll notice first with R-S badges and red color grille logo setting this model apart from plebeian Jaguar wagons and rear bumper with integrated diffuser. 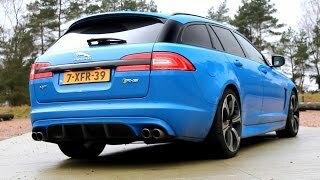 After going through its exterior we with all pride say that the Jaguar XFR S Sportbrake is one of the best looking uber-sedans translating all fury into the wagon. The force fed engine fitted in this elegant piece on its own describes the saga of power it holds within. The quad cams in engine are all made of aluminum, giving strength and lightness. The power through the engine is very well shuffled with help of eight-speed automatic transmission. Nonetheless it can very easily and firmly be said, that this particular amalgamation of the bests will definitely give its driver a joy ride, making the travelling experience for fellow passengers mesmerizing. 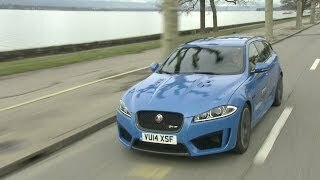 Though the Jaguar XFR S Sportbrake 2015 is best in its category but still competitors are the one any individual must firstly look at. As for this one the competition is expected from the Audi RS6 Avant and Mercedes E63 AMG Wagon.